Each year, the European Association for the Education of Adults (EAEA) celebrates innovation and excellence in adult education. 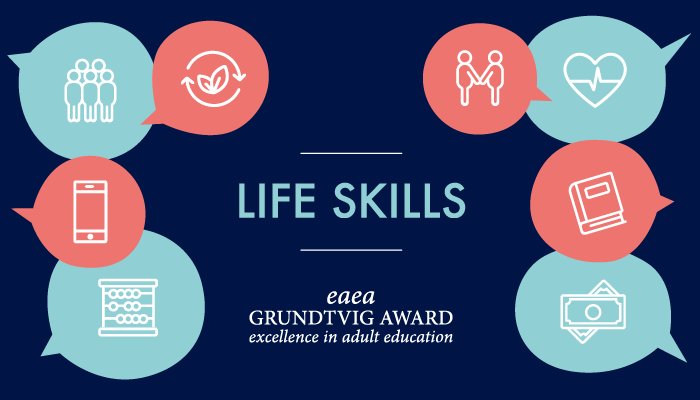 The EAEA Grundtvig Award highlights project results that produce new ideas, new partnerships, new methodologies and a new understanding how we can work in adult learning. Life skills are building blocks of independence and self-efficacy. They are combinations of different capabilities that in general enable adults to become lifelong learners and to solve problems in order to live an independent life as individuals and participate in a collective life within society. Life skills are closely related to the key challenges adults are faced with in the modern world. This means, for example, taking care of their physical and mental health, actively contributing to their wellbeing, mastering financial matters, and coping with the digital environment. When skills are defined in this way, it becomes clear that competences embrace not only the needs of the individuals but also their knowledge and values. Better life skills contribute to social and civic engagement, self-efficacy and employability of an individual. And from a wider perspective, they assure coexistence in democratic society, inclusion for all and active citizenship within a multicultural society. Therefore, life skills are indispensable for an individual to act in a specific environment in accordance with the basic principles of democracy and living together in a diverse society. Life skills provide adults with tools to face new challenges and to provide practical and emotional support to those around them. Life skills are useful for the learners themselves, for people and communities around them and for communicating and transmitting experiences among generations. The current essential needs of the individual are crucial and at the same time the main motivational factor for the combination of life skills that a person may strive to acquire. The accomplishment of the essential needs through life skills provision enables engagement and a positive learning experience, and as well stimulates new educational need. This, in turn, is a long-term benefit, expressed in greater autonomy, engagement and understanding of the challenges, and finally in new educational needs. This also means that the needs of the learners are the focus and starting point of the learning offer. International visibility in EAEA’s social media channels and EAEA website. EU + candidate countries need to have a transnational partnership in at least 3 countries. We are looking for projects that have a strong national or local partnership with a diverse range of stakeholders and show innovative ways of working with partners and in new cooperations. Projects can but need not be supported by the European Commission. They can but need not be Erasmus+ projects. The project or the initiative should be up and running for at least a few months and/or be close to completion. We also accept finished projects but they should have ended within two years of the Grundtvig ceremony (i.e. June 2019). It must have evidence of outputs such as a report, website, or any other form of verification. The project must clearly demonstrate a life skills approach, i.e. combine basic skills training / adult education provision with the needs of the learner. For more information about life skills you can consult the Life Skills for Europe -project. Which life skills were developed and how? How was the learner-centred approach applied? What are the outcomes for the learners? What you have learned – what would you do again or differently next time. If you have any questions, please do not hesitate to contact silvia.tursi(at)eaea.org.